We were on the road at 5:00 a.m. today. Let me be clear that there is not enough caffeine in the world to make that hour palatable to my taste. But there was a plane to catch–at Dulles. So the daughter and I headed out into the fuzziness of night breaking into morning to send her back to the Twin Cities where husband, dogs, work, friends, and her life are located. If roadtrips were ascribed gustatory characteristics, then this early morning sojourn would definitely taste of bittersweet. I’ve done it twice in one week (it being putting daughters on planes), first to BWI and now to Dulles, one to London and the other to the heartland. Both trips have left a dual taste of sadness and gladness in my mouth. I am glad that both daughters have launched into “adulthood” (for what that’s worth) and continue to develop into unique and amazing individuals. I am sad because each time I send them from the safe arms of home into the hum and pitch of this beautiful, broken world I am reminded of the fleeting and precious nature of life and relationship. Yes, bittersweet is the flavor of the day. I can own that reality. I can drink that cup of co-mingled joy and sorrow. And, I can truly say that I am grateful for every minute of their precious, wild, and wonderful lives. I send them into this world knowing that they do not “belong” to me but rather to the Creator of all that was, is, and is to come, to the cosmos and the grand human narrative. They are meant to live their own lives, make decisions, face consequences, craft their futures. And that is as it should be. How thankful I am to be part of their that journey, to be connected to their stories, to hold them in my heart. I raise a glass of bittersweet tears, and I suspect some of you will understand this toast all too clearly. Here’s to holding loosely and to letting go. Here’s to drawing wide hopeful margins with myriad colors. Here’s to love that lets love take flight. Photo: Benson Kua, Creative Commons. Thank you! But the concept of simple is so much more than its dictionary definition–and so much less. If you want to really live life, then keep it simple. Be content. Want less. Let go of more. Declutter both your space and your life. Learn when to say “yes” and when to say “no.” Practice simple living. It may take time to figure out how simple actually works. It’s a countercultural act of defiance. 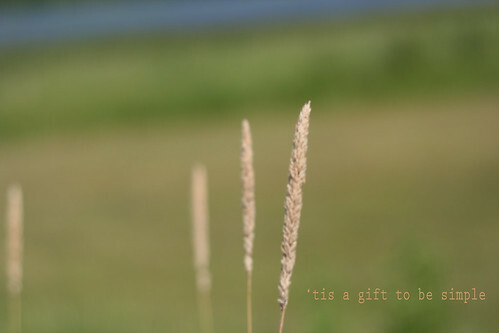 It is gift. Simple is a way to live, a way to be that has the capacity to set one free. Sounds simple, right? Unfortunately, it isn’t so easy. But have faith. Try it. Practice it. You’ll get it. You will learn. It’s as simple as that. Photos by naydeeyah and Kate Ter Haar. Thanks! O.K., I’ll admit it; sometimes I take the rights and privileges granted to me under the United States Constitution squarely for granted. It’s not something I am proud to admit, but hey, life happens, people are busy, and freedoms are easily assumed when you’re living with them. If you need a “brusher-upper” and a quick review of applicable case law click here to be whisked away to FindLaw.com (courtesy one of those great freedoms of speech, creativity, and expression the Worldwide Web, i.e. the Internet). For me, this amendment aims to protect the two things that affect about all that I do vocationally by guaranteeing freedom to practice religion and freedom of speech and assembly. As a pastor and writer, threats to this amendment really hit home. One of these threats is legislation currently before Congress. SOPA — H.R. 3261, the Stop Online Piracy Act and its companion bill in the Senate —PIPA, S. 968, the Protect IP (Intellectual Property) Act. I would like to think that the sponsors of these bills had good intentions, but today one can never be too sure what special interests are at play. The good news is that a powerful public lobby against the bill is happening right now. Several websites search engines and web players are waging a protest that ranges from information encouraging individuals to contact their elected leaders to site blackouts (Wikipedia, Mozilla, Reddit, and WordPress, for example). A good summary about the legislation and the protest can be found at CBSNews. Check out Alexandra Petri’s column in The Washington Post, too. I am thankful for the freedom of speech guaranteed by the First Amendment, and I value the information available via the Internet. Yes, there are people who abuse these freedoms and who profit from such abuse, but I do not believe that it is the Federal Government’s role to regulate such abuse to the gross extent that SOPA and PIPA would attempt. If you value your First Amendment rights and your free access to online content and information, then by all means educate yourself about this issue and take action. If you don’t, who will? If we all count on somebody else to speak up for us, we may just find ourselves silenced and without the rights we so dearly treasure and expect. Today, make yourself happy and make others happy by doing what you can about SOPA and PIPA: spread the word, contact your elected leaders, and (to borrow from Dylan Thomas) “rage, rage against the dying of the light/do not go gently into that good night.” I know, Thomas was talking about death and old age, but isn’t it equally apt to apply his words to a more insidious death–the slow creep of denial of rights and freedoms? Thanks for reading; I’ll step off my SOPA box now and get back to thanks-living! 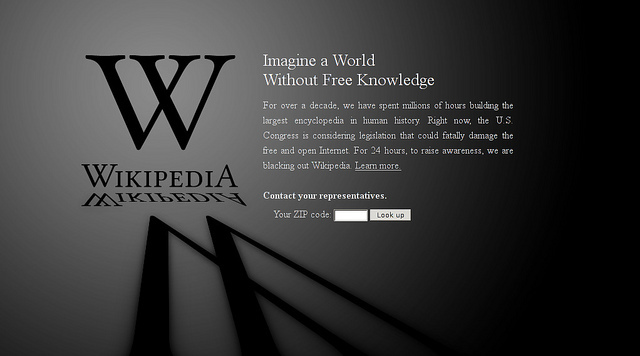 Thanks to opencongress.org for the links regarding SOPA and PIPA. Photos by alicepopkorn and believekevin used under Creative Commons License. Thank you!